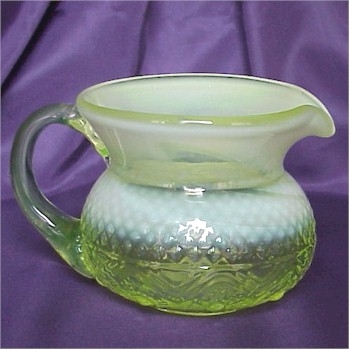 Bennington Round Pitcher in Vaseline Opal, Bargain Shack offers Boyd Glass, Mosser Glass, L.G. Wright, and Contemporary Collectible Glass including Vaseline Glass - J.B. Scottie Dogs, Pooche, Animal Covered Nests, Toothpick Holders, Salts, Glass Animal Figurines, Clowns, Dolls, Slippers, Vehicles, and More! This Bennington Pitcher from Gibson Glass is so detailed. It stands 3-3/4 inches tall and measures 5-1/4 inches from spout to handle. The bottom of the pitcher is marked Gibson 2002. The mould for this piece was originally owned by Pilgrim Glass but when they went out of business Gibson Glass purchased it. Made from vaseline glass topped with that beautiful opalescence this piece is sure to have a special place your collection.